The meeting wa called to order by Rick at 7:32 p.m.
CLERK’S REPORT – minutes of August meeting was read by Lita. Motioned to approve by Lee, seconded by Scott, motion carried with the following additional follow-up report: Lee submitted Lita’s email to DNR. Lita has not received any email from them. Motioned to approve by Lee, seconded by Scott, motion carried. Bank account status. Kim has transferred the funds except $500 from Beacon Bank to Superior Choice Credit Union. Kim, Lee and Lita have all signed the required bank documents. Lee stated that since CUNA can only insure funds up to $250,000.00 and we have more than that, he suggested to move some of the funds to a different institution. Kim will check which institution provides a higher interest. CTAS program status. CTAS software is installed in both laptops. Kim showed the CTAS manual which is 800 pages long. She suggested that she and Lita could request to set-up a meeting with Linda Britton and Ray Barnes of North Star Township to assist with training on the use of the software. The construction of two towers have been approved and construction will begin in October/November. DNR in Two Harbors rejected the request to vacate the 33-foot lot the State owns on Big Pequaywan Lake. There is already a plan in place between 2017 and 2019 for construction of landing for public access. Motion by Scott, second by Lee, motion carried. there will be a Special Primary Election on September 29 and Special General Election on December 8.
she is required to publicize in the newspaper; i.e., Duluth News Tribune, about the Public Accuracy Test of Automark (machine that may be used by voters instead of paper copy). Bob McDonough and Kathy Sluka needed certification as Election Judges which will be good for two years. Lita asked if the supervisors would like her to submit Bob and Kathy’s names to St. Louis County Election Department so that they will have a record of the certification which will be good for two years. They will be paid the regular pay for the training that Lita will conduct. Motioned by Rick, seconded by Scott, motion carried. an announcement should be posted on September 15 to announce the date, time and location of the election. Possible posting places are online at pequaywantownship.org, pequaywan.com and hard copies at Pequaywan Inn and Pequaywan Firehall. The Special Elections will be conducted from 10:00 a.m. to 8:00 p.m. for both the Special Primary Election on September 29 and the Special General Election on December 8. Motioned by Rick, seconded by Scott, motion carried. 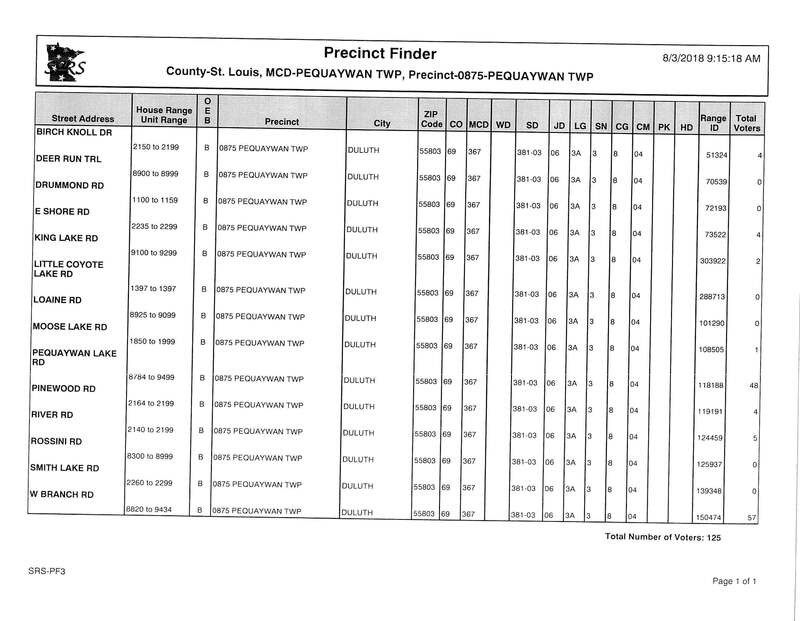 ballots and other election materials will be ready for pick up at St. Louis County Courthouse on September 17. Lita will pick up and for security purposes, she will keep the materials at her home before and after the election. All the materials will be delivered back to St. Louis County the day after the election. With the additional job duties and skill requirements related to CTAS plus other functions performed by the Clerk and Treasurer, Lee proposed to increase their hourly compensation by $5.00 so to make it commensurate to the tasks they are performing. Other comments was to make it competitive in the market. Rick suggested to table the discussion for October meeting. Rick supported a request from a resident to send a letter to St. Louis County requesting removal of dead trees at West Branch Road within the easement. Motioned by Scott, seconded by Lee, motion carried. A proposal was made for the supervisors to support a grant application to the DNR’s Firewise Program. The purpose of the grant is to mitigate the risk and impact of wildfires in Pequaywan Township and the resulting damage to buildings. The suggestion was also to have the Township act as a fiscal agent, specifically, the Treasurer, to receive the funds. Any expenses for the above stated items will be coming from the grant instead of the Township. Rick motioned to sign the form, seconded by Scott, motion carried. Dale Brooks, Fire Chief of Pequaywan Fire Department, mentioned that dead balsam trees, where the sign will be put up, is in the process of being cut. Rick reported that Pequaywan’s State Demographic is 123 residents with a household estimate of 60. Claims Report: Total Claims – $1,017.26. Motioned to approve by Rick, seconded by Lee, motion carried. Motion to Adjourn at 8:40 by Rick, seconded by Scott, motion carried.